Bikes are a great means of transportation; they are easily manoeuvrable, enjoyable to ride, and spend much less to operate as compared to vehicles. Thanks to bike cargo trailers, bikes now have overcome the problem associated with storage for cargo transportation, effectively making them ideal for running small errands in your neighborhood whether it is shopping or taking your child for a ride. However, all this depends on the specific cargo trailer that you buy as different trailers vary in factors such as size and design. So, how do you choose the ideal trailer? Here are factors to consider as well as some of the best bike cargo trailer reviews. There are different needs for bike cargo trailers ranging from carrying groceries and small cargo to taking your little one for a ride around the neighborhood. To this end, important factors such as design, size, suspension, and price, should be considered before making a purchase. Here is what you should look for when choosing the best bike cargo trailer for your needs. 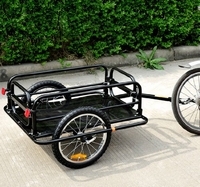 Bike cargo trailers come in one-wheel and double-wheel designs. Single-wheel trailers come with advantages such as maneuverability, light weight, and steady adjustment to the bike. However, they are not as stable as double-wheel trailers, and you have to balance them when coming to a halt; hence, they are not ideal for carrying fragile cargo as it may easily fall off if you are not careful. Double-wheel trailers, on the other hand, offer benefits such as stability, ample storage space, ability to hold heavier loads, and proper weight distribution. Unfortunately, they are not as maneuverable as the former as they are wider and heavier than the former. Bicycle rides tend to get bumpy especially when riding on off roads, and this is usually a big problem when you have cargo loaded in your trailer. Hence, it becomes important to choose a trailer with a suspension mechanism to absorb the shock and shaking caused by the unavoidable bumps and potholes. In addition to the safety of your cargo, a trailer fitted with suspension mechanism offers a smoother and quieter ride for comfort and convenience. Some trailers are simple in both style and design as they are suited specifically for carrying cargo. Others, however, feature sleek styles and design that allow you the convenience of not only concealing your cargo but also riding in style. If you intend to carry your child on your trailer, then you will need one that is not only stylish but also fitted with cushions that can offer utmost comfort. Bike cargo trailers come in a wide range of prices ranging from a couple of hundred dollars to even above a thousand depending on the quality and features offered. Ideally, the most expensive one would be considered the best. However, you can do away with some of the extra features that you may not need and settle for a trailer that is both affordable and suitable for all your needs. There are numerous bike trailers in the market today, and their diversity makes it quite difficult and confusing to choose the one ideal for you. 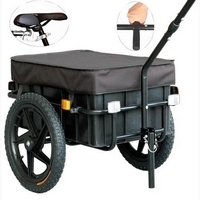 To save you the trouble here is a brief insight of the five best bike cargo trailer reviews. The Aosom Elite bike cargo trailer has virtually everything that you would need in a trailer: ample storage space, stylish appearance, excellent weight-carrying capacity, and compatibility with almost any bicycle. The trailer is capable of holding up to 180lbs and large enough to carry more than just groceries. It also features a removable cover that not only conceals your cargo but also gives you a stylish look. It also folds and assembles easily and quickly for easy portability. What’s more, the double-wheel design makes it stable and ensure flawless transportation of fragile goods both on-road and off-road. Perhaps the best thing about this trailer is that it is incredibly affordable in spite of being packed full of convenient features. Sleek, compact, and just big enough to hold your cargo safely in place, the Veeler shopping and bike cargo trailer offers the ideal user experience. It is slightly smaller when compared to other trailers reviewed in this article, but to its advantage it is compact, strong, and easily manoeuvrable; it is, in fact, small and stylish enough to double up as a shopping cart. The trailer is strong enough to hold up to 88lbs, and it comes with a suspension mechanism to absorb shock and guarantee the safety of your cargo. It also comes with a removable cover that offers much-needed privacy when you are carrying sensitive goods. 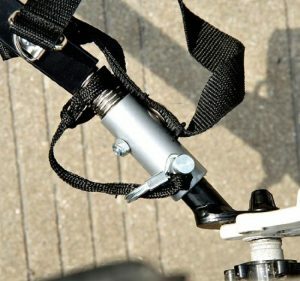 What’s more, it is designed to be compatible with most bikes as it features a universal coupling. This cargo trailer may seem simple, but it is very convenient and handy. In spite of its humble appearance, it is capable of carrying cargo weighing up to 100lbs and large enough to hold more than just your groceries. It also dissembles and assembles quickly and easily with the simple push of a button. Unfortunately, this trailer does not feature a cover or suspension mechanism, and hence is limited to carrying insensitive cargo; however, there is always the option of buying a waterproof tarpaulin separately. On the bright side, however, it is very affordable and compatible with a wide range of bikes. Stability, simplicity, and plenty of storage space are what the Aosom Wanderer bike cargo trailer offers. 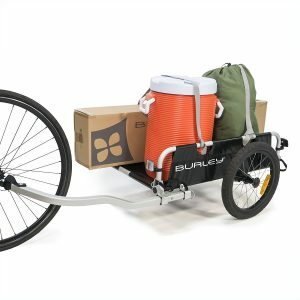 The trailer comes in a sleek black color and steady steel frames that hold cargo as heavy as 110lbs. What’s more, the frames are easy to assemble and fold down to make it easily portable. This trailer features two wheels that ensure stability even when riding at high speeds or on bumpy roads. For safety, the trailer features four reflectors in the back and wheels to make you easily visible at night. You are guaranteed value for your money as this trailer is very steady and durable. Unfortunately, it does not feature a suspension mechanism, but its average size and thick tires nonetheless make the ride smooth. This trailer weighs less than 15lbs but it nevertheless capable of carrying cargo weighing up to 100lbs. It sets itself apart from the rest in many aspects including the shape, style, and design; it does not feature the common rectangular shape but rather a canopy shape complemented with a water-proof cover to not only keep your cargo private but also safe. Although it does not feature a suspension mechanism, the 16-inch wheels, coupled with its compact nature, ensure that the ride is smooth both on-road and off-road. When need be, it can be easily dissembled and folded to a small size for easy portability so that you can take it with you virtually anywhere. Bikes are now not only fun and healthy to ride but also convenient for when you wish to transport small goods around. All you need for this is a good bike cargo trailer, and you are guaranteed to find one ideal just for you from the above reviews. If not, then remember to take all the tips into consideration to ensure that you get utmost value for your money and the ideal user experience suited to your specific needs and preferences.